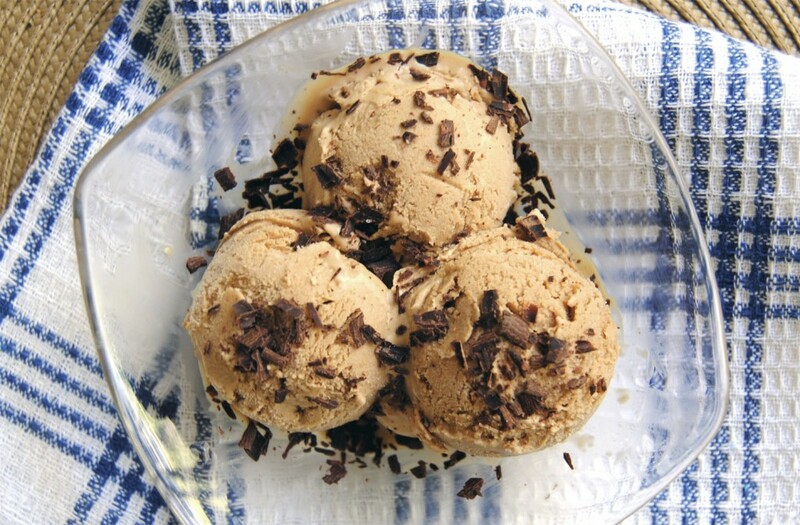 This incredibly creamy ice cream is quick and easy, but more importantly, it tastes just like an Irish Coffee. Yum! I love coffee. I mean, I really love coffee. Whether it’s a big, giant mug of filter-style coffee or a super strong shot of espresso, I just love it. I don’t drink a lot of it, and I don’t even drink it every day, but when I do, I savor it. Some of my friends here tease me because I take too long to drink my coffee but that’s just because I genuinely enjoy it and want it to last as long as possible. To me, coffee tastes like lazy mornings, soft blankets, sleepy conversation and that wonderful feeling of stretching out your arms and legs as far as they’ll go. It tastes like waking up. One of my absolute favorite ways to enjoy a cup of coffee is in an affogato, which is a shot of espresso poured over a tiny scoop of vanilla ice cream. It’s one of my favorite treats, or what the Portuguese would call a mimo. It’s a great word, coming from the verb mimar-se which means to spoil or indulge oneself. We should all give ourselves more mimos, don’t you think? Here’s a good mimo for you, and I think it’s even better than an affogato! 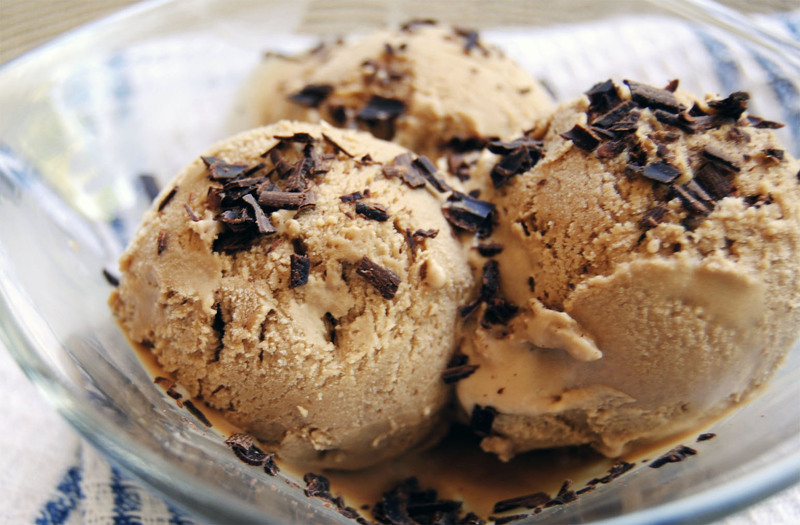 It’s an incredibly simple coffee ice cream with just enough whiskey to make it taste grown-up. Sprinkle dark – but really dark – chocolate shavings on the top. Just trust me on this one. When I saw Nigella’s recipe for no-churn, one-step, four-ingredient ice cream, my immediate reaction was “yeahhhhhhh right”. I was skeptical. This ice cream really is perfect, though. It’s not icy or crunchy as you might expect a no-churn ice cream to be. It’s creamy and smooth, with just the right consistency. You could probably use a bit of strong coffee instead of the espresso powder. I wouldn’t omit the alcohol because I think it helps prevent the ice cream from freezing solid, but if you’re not a fan of whiskey you could certainly use coffee liqueur (as the original recipe does). This would give it a more subtle flavor. I’m dying to try other flavors using the same base of cream and condensed milk. Vanilla bean, fresh fruit, caramel, nuts, fresh mint and chocolate chips… mmm, the possibilities. Let me know if you play around with this recipe! Combine cream, condensed milk, espresso powder and whiskey in a large bowl. Whisk with an electric beater until soft peaks form – the peaks will be very soft, and the beaters will leave soft trails in the mixture. Pour into an airtight container and freeze for at least 8 hours. Yes, it really is that easy. Now, take a bite and try not to swoon. The affogato is my fave, too! This sounds amazing. OH MY GOD ! You are your mother’s daughter, and I am going to the grocery store…right now!